Gone are the days when you could only get a classic perm and a regular hairstyle at your local salon. These days, salons offer everything from styling, shampooing, coloring and anything else under the sun. Hairstyles and hair trends are just like anything else: they evolve every season and stylists need to keep up with the demands of their clients if they want to retain them. As a salon manager, it is important to invest in professional trainings for your employees, to have the certainty that they can offer any type of service a potential client might request. At the same time, salon managers should support their stylists with high quality products, because regardless of a stylist’s talent, if they aren’t using quality products, their work will be in vain. Much like beauty trends, beauty salon customers do not visit these establishments only to get a haircut, but rather, they are interested in the entire experience. Of course, the hairstyle they get needs to be impeccable, but the overall ambiance is also important. This is why many salon managers choose to invest in relaxing music, décor and other details that will make the experience of their clients perfect. Many salons now offer refreshments and/or treats to their clients, scalp massages before the actual haircut and generally anything else the client might want. All clients expect to receive their services promptly, as few people have the patience to wait for half an hour before their stylist can see them. Basically, everyone expects to get on that chair as soon as they enter the salon. Mixing up appointments or not having a certain product available is no longer an option for salon managers, because they risk losing their clients in the favor of other salons that have invested in the necessary booking and management software. As a service provider, you need to be able to make appointments on the go, even when you are not at the salon as well as confirm or alter the appointments of those who request it. Salons use dedicated apps and software just as much as any other business that works directly with its customers and this technology helps them to improve the quality of their services and client retention. To conclude, these are the main trends that any beauty salon manager should know and follow. Since the competition in the beauty market continues to grow, the ability to successfully adapt to the expectations of the clients plays an important part in the success of a beauty salon. What ingredients are needed for a successful hair salon? Most owners believe that a good location plus experienced hairdressers are the recipe for a prolific presence on the market, but this belief is one of the reasons why so many businesses flop. Well-trained staff is of course the major requirement in this line of work, but the key to success is not that simple and does not include just one element. There are hundreds of little details that you, as an owner, need to look at. Unfortunately, even the most diligent entrepreneur can make mistakes, so here is a list of things you should not do if you want to grow your business. Today’s customers are smarter and more informed than ever, which also makes them more demanding and difficult to please. Therefore, do not associate your salon with mediocre brands. When seeing a hairdresser, clients expect more than the average service. If you use drugstore brands, clients can be dissatisfied and switch to a competitor who uses higher end products. Also, using “salon-quality” products might not suffice if they are not exclusive to your salon. Nowadays, almost everything can be bought at half price online, so clients will consider leaving you if they find your styling products elsewhere. To maintain customer retention, consider switching to a brand that only you carry. Hair salons are one of those businesses where the relationship between a client and a service provider can sometimes be more important than the quality of the services provided. People go to salons to look good, but also to socialize and to feel special. Between an efficient hairdresser who does not try to be pleasant and an average one who is attentive and polite, a customer is more likely to choose the latter. 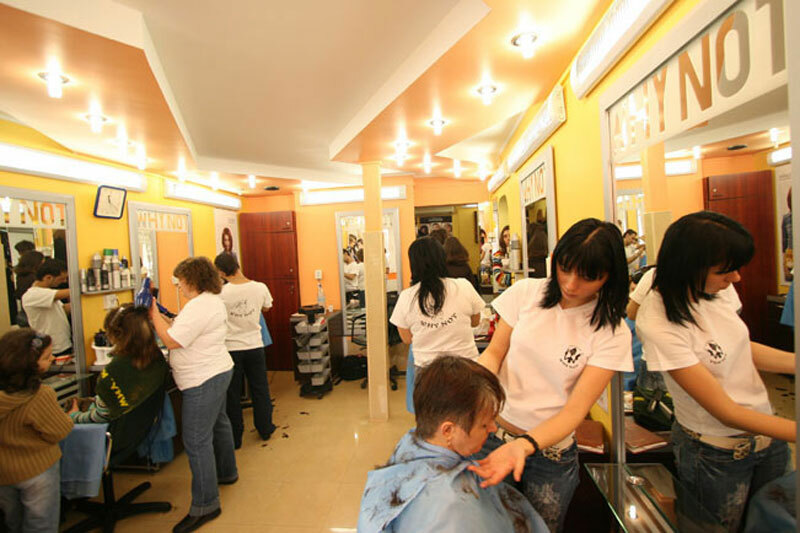 Therefore, as the salon owner, you should choose your staff carefully, focusing not only on their technical skills, but also on their demeanor and personality. It goes without saying that each dresser should have the right qualification, but they should also be taught to listen to clients, engage in conversation and value their opinion. Technology interacts with almost every field of activity, so you should not neglect its importance. The core of a hair salon is manual work, but that doesn’t mean client relationships cannot continue in the online world. For example, you can use the power of social media to promote your services, organize contests and ask for feedback. Also, you can make your work more efficient by using various apps created for salon activity, such as online booking apps and inventory management apps. Neglecting customer service is the first step towards business failure, so you should never forget that each and every person walking in your salon must be treated with care and respect. Interestingly, many salons get to this stage when they have become stars in their neighborhood, have a lot of daily appointments and treat clients with high respect. When the number of appointments increases, you have to be ready. Hire more staff, expand the venue or allocate more space to the waiting area. When hairdressers have too many clients, they risk being sloppy and causing great financial losses to your salon.